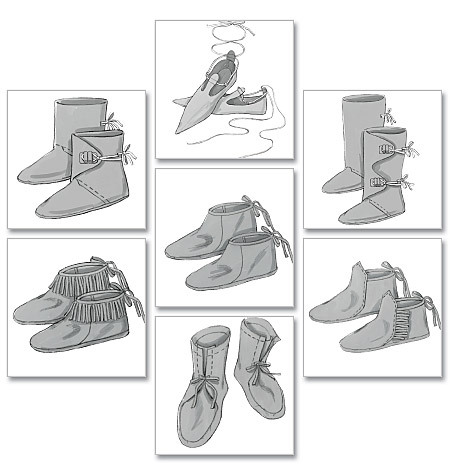 HISTORICAL FOOTWEAR: Package includes patterns and instructions for footwear in sizes XXS through XL. A: lined, below ankle. C: boot length. D, E, F: ankle length. B, G: above ankle length. Purchased cushion insole for all views. A, B, C, G: purchased leather lacing. NOTE: sizes are based on men�s shoe sizes. NOTIONS: All Views: Thread, One Pair of Cushion Insoles and Fabric Glue. A: 41/8 yds. of 1/8" Leather Lacing. B: 13/4 yds. of 1/8" Leather Lacing. C: 31/2 yds. of 1/8" Leather Lacing. G: Awl or 1/8" Diameter Leather Punch and 11/4 yds. of 1/8" Leather Lacing. FABRICS: Synthetic Leather and Synthetic Suede. Lining A: Cotton and Cotton Blends.